I think I’ve managed to beat the crowds in Berrima. Visitors to this 1830s established village are still probably perusing the shops, poking around the Berrima Courthouse or lost in the hedge maze in the gardens of Harper’s Mansion. With my sightseeing done and dusted, and a few packets of loose-leaf tea stowed in my handbag, I’m an early bird at The Courtyard Cafe, there are still plenty of tables available both inside and out. It’s Saturday morning and the scones aren’t long out of the oven. Fresh, light and fluffy with a light dusting of icing sugar – what more can you ask for in a scone? It’s a shame that the jam is average and the cream super light and airy, but the scone carries these guys even though they aren’t up there in the quality stakes. Overall: A homely cafe that seems popular with the locals. After wandering through Berrima’s antique shops and a visit to the historic Berrima Gaol, stop by the graceful Olde Magpie Cafe. Radiating an air of elegance and sophistication, it earns it’s place among Berrima’s best. Slink back into deep comfy wicker chairs out the front or remain indoors and enjoy the indulgent interiors. With heavy white cotton table cloths, its more restaurant than cafe, but who needs more formalities in the Southern Highlands? The Devonshire Tea is top class, with melt-in-your-mouth slightly sweet scones dusted in icing sugar accompanied with double thick dollop cream that holds itself together well in the 35 degree heat. Tea: A selection of loose-leaf teas served in a large pot with extra hot water. Overall: Elegant and refined, settle in for a few hours. 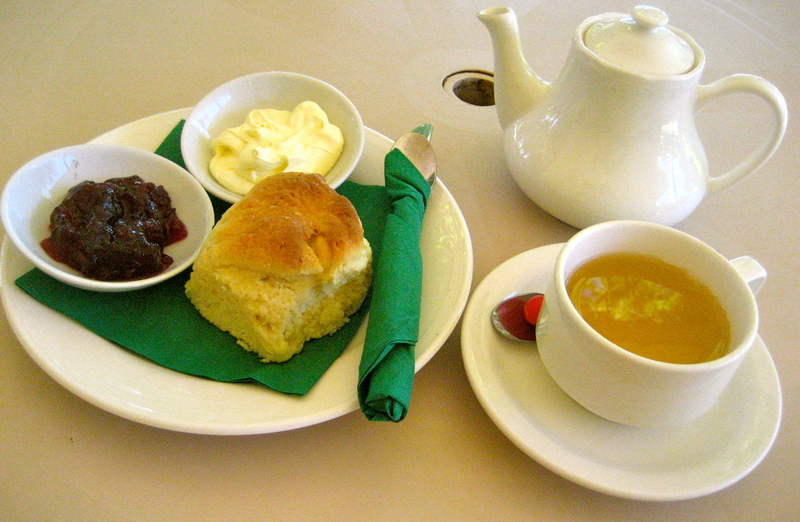 In Australia, the Country Women’s Association (CWA) is renowned for their scones. Anyone who has been to Sydney’s Royal Easter Show may have eaten one of the 10’s of thousands of scones baked by the ladies during the event. It’s not much different at Tulip Time in Bowral, where the local ladies have their heads down and aprons on as they bake up a storm for customers at the tea rooms. The CWA Tea Rooms are only open for Devonshire Teas and other treats during the two-week event when tulips of every hue explode in picture perfect formation in Corbett Gardens. The festival pulls in the crowds, and it’s standing room only in the Tea Rooms when the coaches pull up. If you like flowers, or tulips in particular, the gardens and themed garden arrangements are spectacular, and pretty Corbett Gardens is the ideal location. No doubt the ladies bake to strict guidelines as laid out in the CWA recipe book. 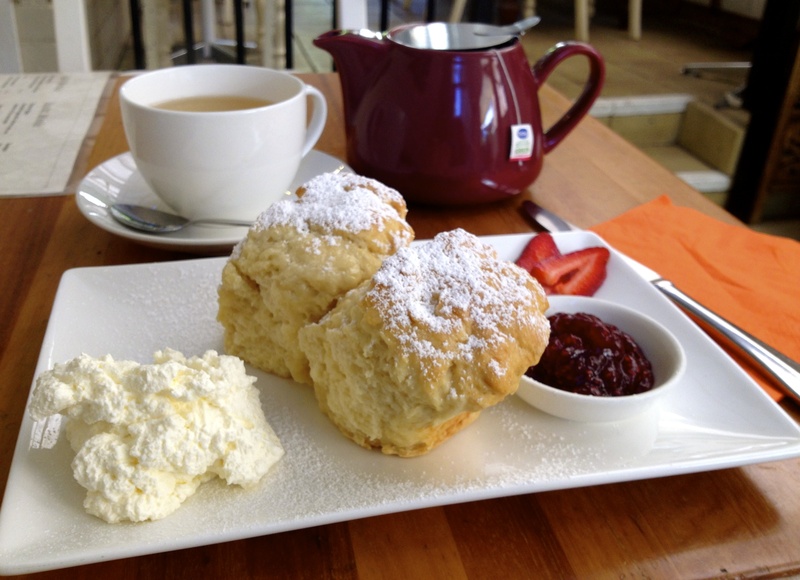 The scones are fresh with a creamy texture, and the fresh cream whipped thick. But what happened to the housemade jam? Maybe the jars for sale in the their shop should be swapped for the average stuff they serve customers. Swing by the shop for that elusive housemade jam and a range of hand knitted items. Tea: A small selection of Madura tea bags served in a small pot. Overall: The CWA at it’s finest. There’s something sophisticated about a gallery cafe. Maybe it’s being surrounded by art and people’s creations, and the hushed chatter that goes on (so as not to offend the artwork?). I don’t mind art, but what really impresses me are heritage buildings, or properties that tell a story. Although the Old Milk Factory in Bowral doesn’t make mention of it to the non-the-wiser visitor, and you have to look hard to see any resemblance, it has a story. In the 1870s, Bowral began shipping off its milk so by the 1930s the Milk Factory was built to help with the demand. Information about the site is thin on the ground, but putting two-and-two together I assume that milk and other milk products were processed here, deposited onto trains (the building can’t be any closer to the railway tracks), and hauled off to Sydney. It’s a fascinating thought, what went on here under 100 years ago. Today, rebuilt, the Milk Factory Gallery is an art gallery with a cafe offering two outdoor areas as well as indoor seating area for colder weather. When I visit, it’s still breakfast time, so the scones, infused with a hint of vanilla, aren’t long out of the oven. The jam is nothing more than an average strawberry jam, and although the cream is fresh it is very lightly whipped and doesn’t stand up to the warm scone test too well. Tea: A handful of loose-leaf teas served in a pot. Overall: A pleasant alternative to Bowral’s Main St cafes. The Vintage Tea Salon is the bomb! What can I say? 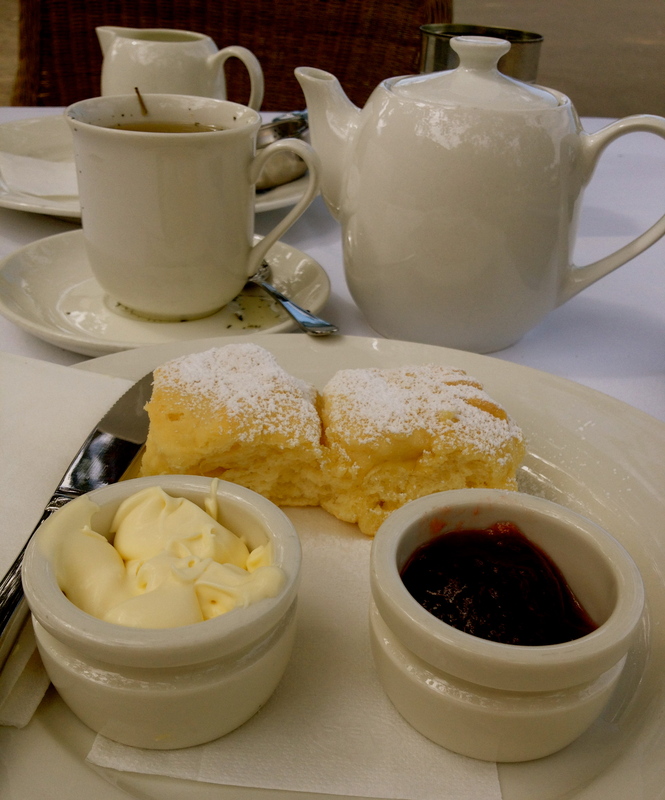 The quality of the scones to the tea served in silver teapots is exceptional. Located in one corner of Dirty Jane’s Emporium, a cavernous shed housing small unmanned shops selling anything from second-hand vintage clothes and furnishings, to brand new homewares, the tea salon is doing a roaring trade. It’s not just the quality of the food that has me hooked, but it’s the little touches like the vintage tea ware, including the milk jug and the sugar bowl, to the cosy nooks that you can crawl in to on chilly days. The menu is impressive too. As if the plain, lavender, date, and rose scones aren’t choice enough, there’s a coffee/walnut/white chocolate scone on the specials board the day I visit. Each order comes with two scones, but if you ask nicely, they’ll let you pay a dollar or two extra to have a couple of flavours. I try the rose scone, which comes with pretty rose-coloured cream that’s topped with a few tiny rose petals. The scone is crisp and light, and as if it needed to look any prettier, a rose bud is imbedded in the top. The rich berry jam is delectable, and couldn’t be any better. The lavender scone is much the same, light and crisp, and is served with mouth-watering thick lemon curd and thickly whipped fresh cream. It doesn’t matter whether you do your browsing through the shed before or after, just make sure to take a break at the tea salon. Tea: A superb range of loose-leaf teas by Highlands Tea Company (including their Specialty Tea range). My tea was served in a posh silver teapot. Overall: A ‘must eat at’ establishment in the Southern Highlands. Devonshire Tea fans with a cricket tragic in tow will love this venue. 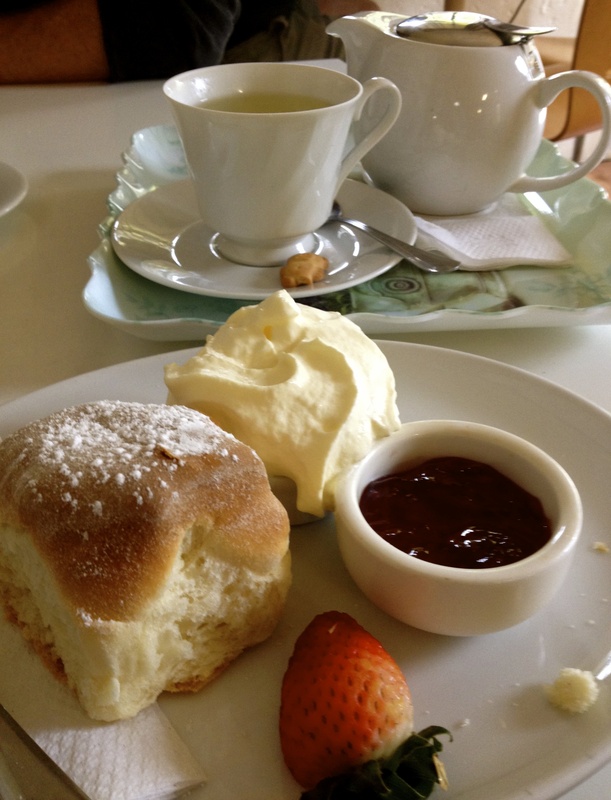 After checking out the new more interactive The International Cricket Hall of Fame, formally known as the Bradman Museum, you can take scones and tea at Stumps Cafe. The cafe has indoor dining for those chilly Southern Highland winters or in the warmer weather sit, as I did, outdoors in the cool of the trees overlooking Bradman Oval where the young Don Bradman first learned to play cricket. When I visit it was still called the Bradman Museum and the construction of the additional buildings was well underway. 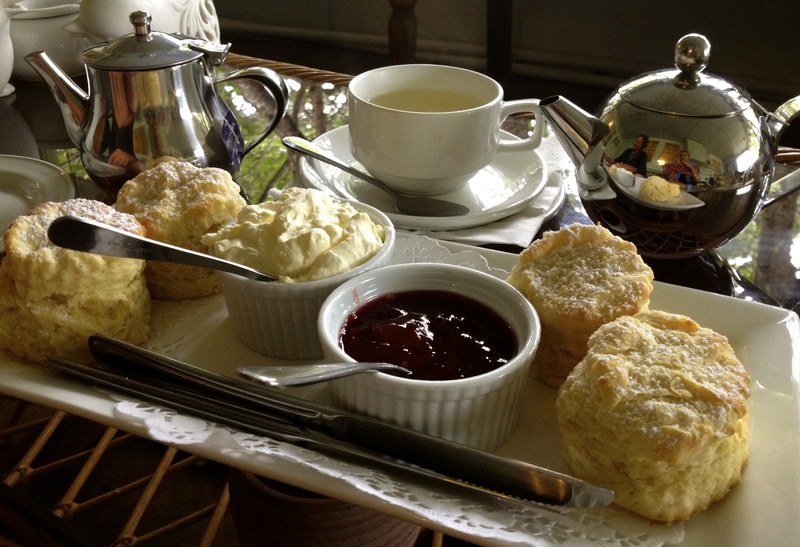 Known here as scones, jam and cream, rather than a Devonshire Tea, the serving comes with a single scone with thick cream and stock standard strawberry jam. I called recently to check whether there were any changes to the scone situation and it was recommended to call before visiting as they don’t bake scones everyday. Tea: A variety of teabags available in a large pot. Overall: A lovely view over the cricket oval. I’m through the door and eagerly awaiting my scones early on a Wednesday morning and I’m not sure whether my timing guarantees me fresh scones. There’s a variety of seating areas at The Terrace Tea Shop, but I choose one of the nooks rather than the front or back outside areas as it’s blowing a gale. My scones arrive looking mighty fresh. They’re hearty but light and fluffy, and definitely out of the oven this morning. The raspberry jam is rich and thick, and it’s so good that I want more. I don’t often, actually I may have only come across ‘mock’ cream once, but the dollop of thick cream is reminiscent of the cream used in cream buns from when I was a kid. Not my favourite type of cream, but it works. The cafe is open from Wednesday to Sunday, so time your visit. Tea: A selection of black loose-leaf teas and a massive range of herbal and green teas in tea bags served in a generous sized pot. Overall: The type of cafe you could happily spend a few hours in. I wouldn’t normally review a Devonshire Tea that is only available to in-house guests at holiday accommodation; however, this one included in a 2-night stay at Treetops Country Guesthouse is way too good to be kept a secret. Bundanoon is nicely tucked away from the busier towns in the Southern Highlands such as Bowral and Mittagong, and is the gateway to Moreton National Park and at night, the Glow Worm Grotto shines spectacularly. The scones you can only have if you bed down under the same roof as the baker are finely balanced; just the right size so as not to spoil the appetite, fresh from the oven with an ever-so-slight dusting of icing sugar to give it a slight sweet kick. The rich strawberry jam is homemade, and you’ll only do better with the thickly whipped cream if it were clotted. Just thinking about it and I’m almost inclined to check in again for another stay! Price: Included in 2-night tariff. Overall: Stay here if you want a great Devonshire Tea. I want the Devonshire Tea to be good so I can give it a great rap. Unfortunately it doesn’t cut the grade, which is a shame as Ye Olde Bicycle Shoppe and Cafe is cool. Outside on one of the walls of the 150-year-old building, you can’t but fail to notice the painted mural, plus the old-fashioned bike out the front, and dah, how about the cool name? In a town that only has one restaurant open 7 days a week for dinner (Chinese), this cafe is a hub of activity. The cafe doubles as a bike rental shop and is a magnet for cyclists, offering information on bike trails in the nearby Moreton National Park, plus you can buy any bike bits you may have forgotten. The bad news is that the scones are stale, too sweet and bread like, and the cream so light it’s almost liquid. I also find the peppermint tea a bit weak. 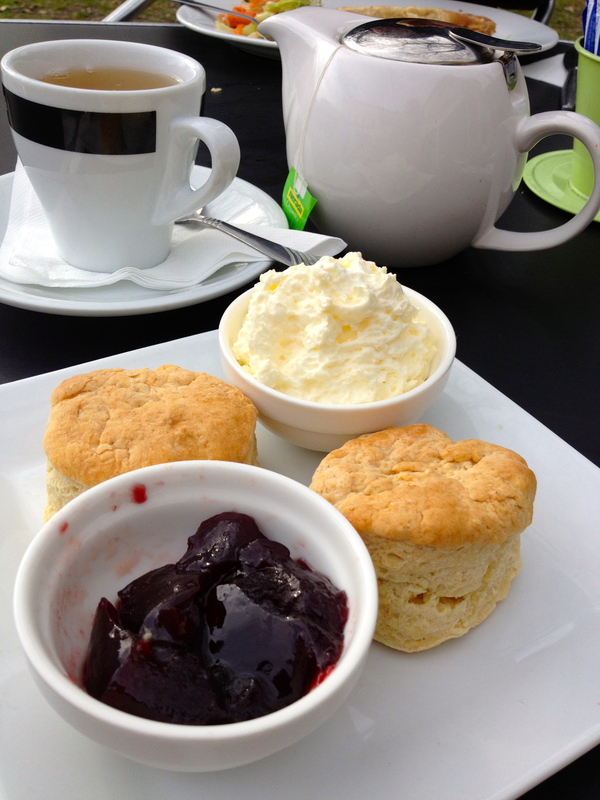 As I said, I really enjoy the vibe, but they need to pick up their scone game. I’m glad I asked for a half serve. Tea: A selection of loose-leaf teas. Overall: A hub for all manner of cycling stuff. Brewster Cafe manager, Steve Evans, is an affable host. He’s welcoming and loves a chat about the cafe’s decor, which is consists of British memorabilia and a vinyl record collection that probably is better described as wallpaper. According to statistics in a recent edition of the SMH Good Weekend, record or LP sales (or demand for) are now on the rise. As they say, everything old is new again, and it was only going to be a matter of time when the hipsters were in the market for stereos and vinyl records. For the record (no pun intended), Steve is not a hipster, and it’s not that sort of cafe – it is the Southern Highlands after all, not Surry Hills. However, the cafe is bright with a welcoming refectory table taking up much of the floorspace. There are a few tables out on the footpath and a simple courtyard out the back, which is decorated with fairy lights when the cafe is open at night. 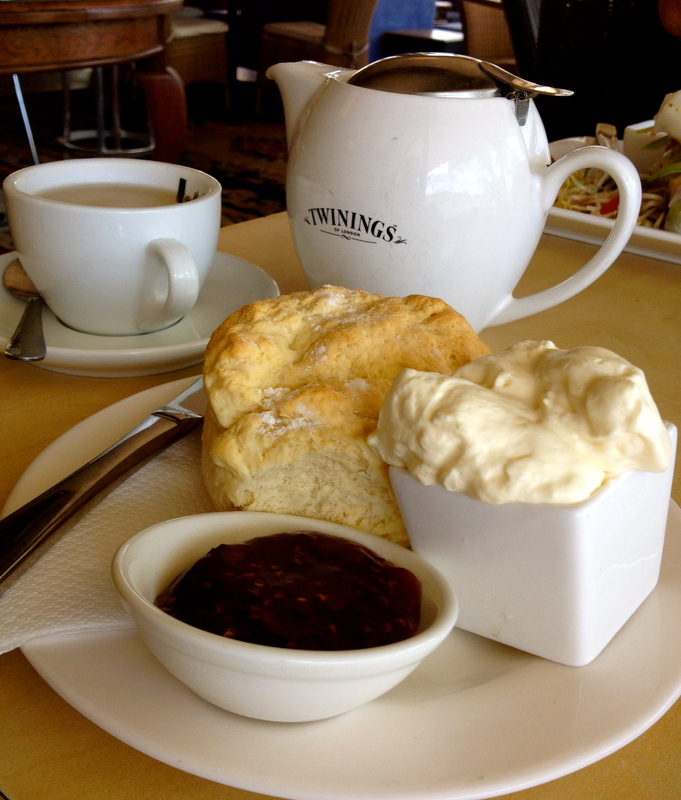 Scones are single serve, which is great if you are travelling solo or just want a snack. The lemonade scones are robust and err on the heavy rather than light and fluffy side. The thickly whipped cream is lovely and slightly sweet, and gives a boost to the stock standard strawberry jam. The cafe is an absolute delight, but I’m biased, as I love all things British! Tea: A good range of loose-leaf and tea bag teas served in a teapot. Overall: A fun and friendly cafe for vinyl lovers. The Southern Highlands, usually a cool respite from the heat on the lowlands is sweltering today, just like much of the rest of the state. The streets are quite deserted and I am thinking everyone is indoors escaping the heat. And that’s just what we do at Gilbert’s of Mittagong. The spacious cafe is light and bright but cooled down by the air conditioning. There’s a selection of seating including a few lounges, and a few tables outside for those who like to brave the elements. The scones are huge, so huge that I opt for just the one. It’s tasty but a bit heavy, and more meal than snack. The raspberry jam is rich and the freshly whipped cream is not too light like a lot of them. Although, with a combination of the 35 degree temperatures outside and the warm scone, the cream has no choice but to melt pretty quickly. Tea: Tea Tonic loose-leaf teas served in a big pot. Overall: A spacious and comfy cafe. With a name like The Shaggy Cow, why wouldn’t you check it out? The Shaggy Cow is another bright and light quality Mittagong café endeavoring to entice travellers making a beeline for Bowral or Berrima. It’s buzzing the lunchtime I drop in, but there’s plenty of room in the large space, including the seating out the front and in the alleyway for warmer days. There’s no set Devonshire Tea on the menu, so you can order as many scones as you like. My scone is delectable: soft, fluffy and with a creamy texture. Just as well, because coupled with the rich double thick cream, you barely notice the very average strawberry jam. Brownie points for the warm and friendly service, as it keeps out-of-towners feeling warm and fuzzy. Tea: A good range of loose-leaf teas served in a teapot. Thoughts of the Pied Piper come to mind when I’m at the Exeter General Store. Locals stroll in for their morning caffeine hit, and although the place feels isolated, people seem to stream in from everywhere. Located in the quieter corner of the Southern Highlands, far removed from populated Bowral, Mittagong and Moss Vale, Exeter looks little more than an intersection to the passing motorist. On the contrary, the General Store acts as a hub for coffee and book lovers, acts as the post office, and is a store selling basic provisions and souvenirs for visitors. I’m told the scones are usually sold out before 11am, so I’ve parked myself in front of the ceiling to floor glass shop front by 8.30am, admiring the red tulips in the garden. The scones are fresh out of the oven and are creamy and feather light, and are complimented with tart berry jam and double thick cream. It’s an excellent combination and it’s easy to understand why this place is so popular. The classy tea cosies are a real hit! Tea: A good enough range of T2 loose-leaf teas served in a pot topped with a handmade tea cosy. Overall: Not to be missed! Farm Club Australia prides itself on authentic country hospitality and farm fresh produce. Maybe sharing a table and possibly my meal with the homestead’s resident Irish wolfhound comes under country hospitality. The Irish wolfhound is just one of the quirks of this relaxed eatery, and if you don’t want to share your meal, then a table inside is probably a better option than on the deck or the lawn. Raising a bunch of fancy farm animals for eating; think Angus beef, Toulouse geese, Wessex saddleback pigs – you get the picture, is a definite drawcard for foodies. If you’re up for a spot of shopping, one corner of the cafe is dedicated to a farm shop selling quality products, including the Highlands Tea that’s on the menu. There’s even an array of gardening tools to get you started if inspiration takes hold, plus specialty soaps and some rather attractive leather goods. There’s a choice of either a serving of one or two scones, which is a good idea, especially if you’ve already indulged in lunch. My DT looks better than it tastes. My scone errs on the dry side and is more bread like than scone. The jam is good enough but nothing more than your stock standard cafe variety, and considering we’re on a farm I am expecting something homemade. The spread is topped off with lightly whipped fresh cream. If you want to extend your stay, check in to the accommodation, which is available in the Cowboy Bunkhouse, Tarella Farmhouse, The Old Dairy Cottage, or in the Ashgrove House. Open Wednesday to Sunday. Tea: A good selection of Highlands Tea Company loose-leaf teas served in a good-sized pot. Overall: Go for the wide open spaces and the ‘living on the land’ vibe. The fact that this old building was once a cheese factory up until as recently as 1989 (anything in my life time is recent) is amazing. Actually the Robertson Cheese Factory was pumping out so much cheese that by the end of the 1930s, Robertson was hailed as one of the most productive dairy regions in Australia. The remains of this cavernous heritage building give visitors a chance to feel just a tiny bit of its glorious past. There’s an incredible use of space, with a deli, gelateria and kitchen/homeware shop as well as a cafe in a slightly separate area of the old factory. Pick up cheeses (naturally) and gourmet goodies for a Southern Highlands picnic, or settle in an arm-chair in front of a picture window looking out to the green meadows of Robertson. It’s late in the day (near to closing), so the scones aren’t great, but I’m sure if I arrived for morning tea they would have been fresh from the oven. The mixed berry jam is sensational; rich, fruity and tarte, and the cream is rich and double thick. Whether you’ve just crawled up the Macquarie Pass from sea level, or about to say goodbye to the Southern Highlands, The Old Robertson Cheese Factory is worth pulling over for. Tea: A selection of The Berry Tea Shop loose-leaf teas served in a pot.